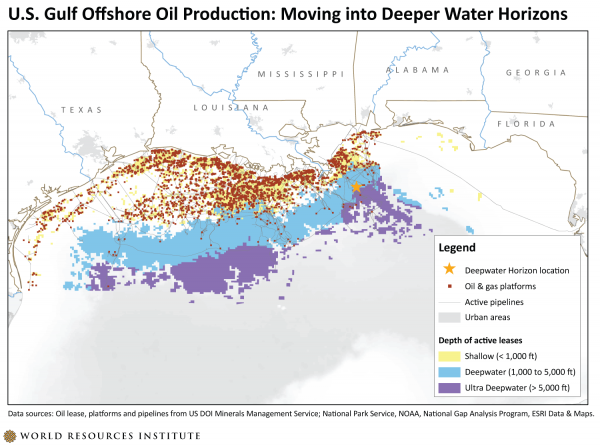 Offshore oil production in the U.S. portion of the Gulf of Mexico represents 30 percent of total U.S. oil production, with 35.6 million acres (an area the size of Maine) under active lease. 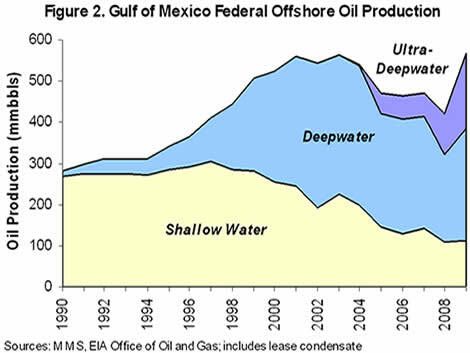 As oil reserves in shallow water are declining, production is moving into ever-deeper water, incurring greater risk. The Deepwater Horizon disaster illustrates the safety, economic, and environmental risks inherent in this trend. Likewise, it illustrates why lawmakers need to enact policies that move the United States in the direction of cleaner, safer energy sources and caps harmful pollution that causes climate change. This work is licensed under the Creative Commons Attribution License. Cite "World Resources Institute."